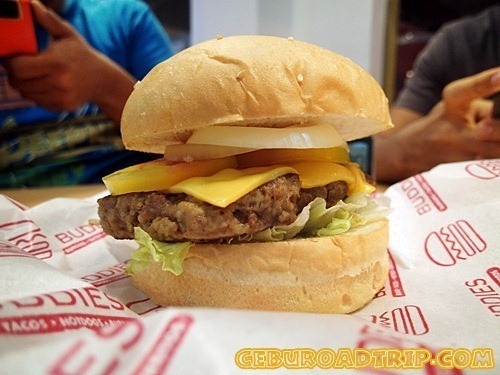 When our good friends, Cecille and Titus, mentioned they wanted to take the ultimate burger challenge at Buddies Burger, I told them I’d join them as I’ve been wanting to go on a food trip ever since I got back in Cebu. Roadtripper Ed just recently got back in town too after his 9-month backpacking stint in S.E.A. 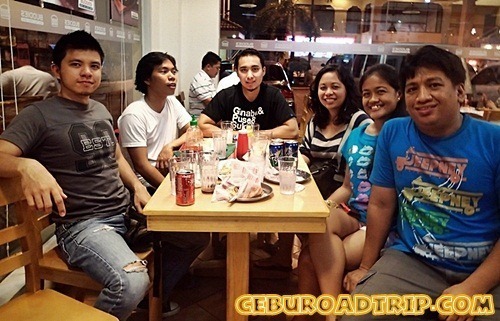 So after clearing our schedules, we contacted a few of our friends to catch up on stuff while trying out the burgers at Buddies. 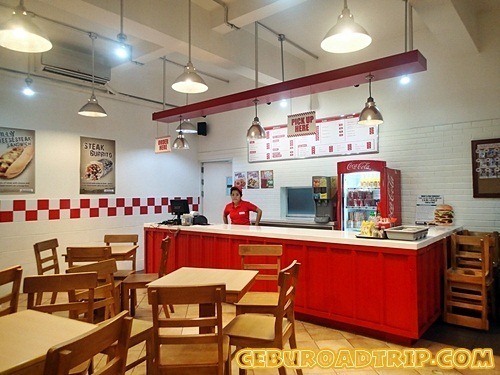 This newly opened restaurant is located at the Piazza Elesia complex in Talamban. A bakeshop used to occupy the space before. I never knew what happened to the bakeshop though. We arrived at Buddies after 7 in the evening. There were a few diners occupying the tables. 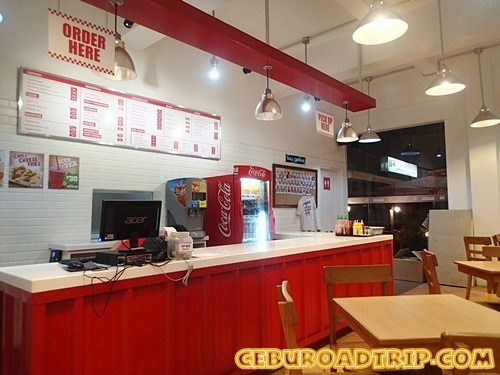 Aside from burgers, this restaurant also serves meals and other sandwiches. The interiors looked neat and the minimalistic design is evident on the establishment’s use of the colors brown, red and white. To order your meals, you’d have to approach the counter and pay up first. 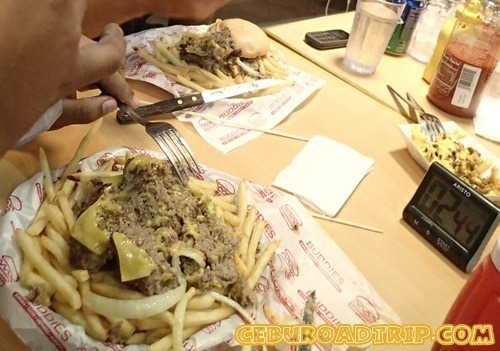 What makes this burger joint unique is the presence of their ultimate burger challenge where you have to spend P350 to take on the challenge of eating their Ultimate Buddy Burger – a burger with 4 layers of patties plus 2 servings of French fries. 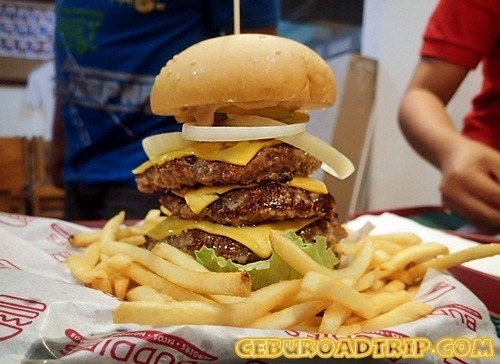 If you consume all of it in 5 minutes, your P350 will be refunded and you’ll be awarded with a free bragging rights t-shirt that says you have conquered the ultimate burger challenge. 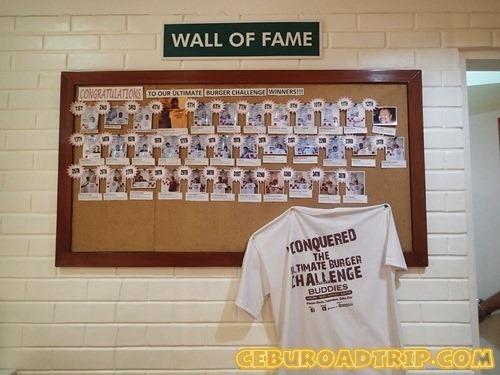 On top of that, your face will appear on the Buddies’ Wall of Fame along with those other diners who have conquered their quadruple burger. 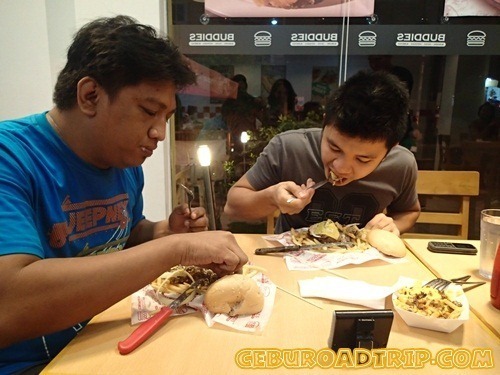 At first, Titus and ceburoadtripper Ed were hesitant to try the challenge because they also want to enjoy the regular food that the restaurant is serving. But after a few words of encouragement, they gave in. Cille, Ayn and I ordered their regular Buddy Burger. I made a side order of their Chili Cheese Fries and Cecille added the Cheese Quesadilla. 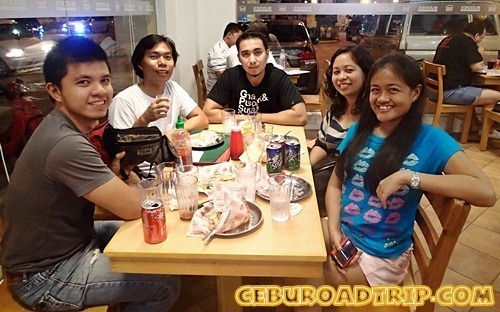 After paying our meals, we found a nice spot at the corner and impatiently waited for the huge burgers. While waiting, our two contenders prepared for the challenge. Their orders came last, which was a good thing as it gave them more time to prepare. They took turns going to the bathroom and Ed made sure he unbuckled his belt to avoid any discomfort in chowing down the burger. Our regular Buddy Burger arrived first. When we inspected what’s inside it, we discovered it wasn’t much. 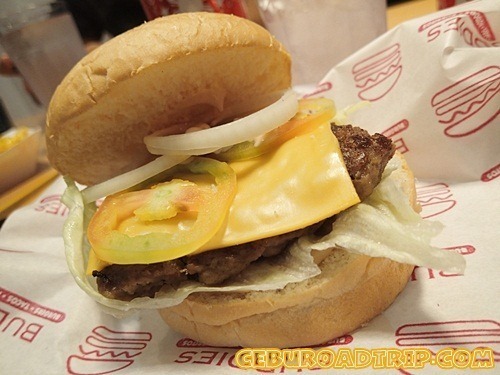 A thin layer of lettuce was sitting at the bottom of the burger bun. The fat patty sat on top of it followed by a slice of cheese, 2 slices of fresh tomatoes and onion rings and a poor amount of mayo was spread on top of it. If you’ll look at the burger, you’ll see that it’s fat. The taste isn’t bad once you grab a bite. The burger patty is juicy but I constantly reached for ketchup and mustard to add more flavor to the burger. 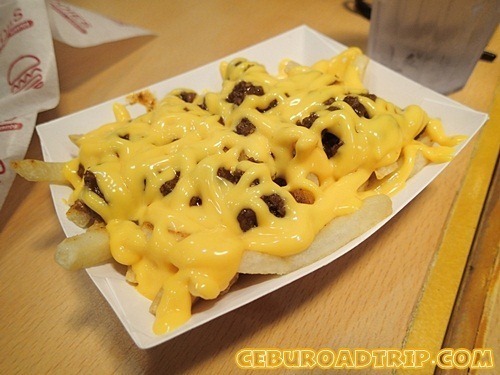 When the Chili Cheese Fries arrived, I immediately attacked the side dish. I was hoping for the Chili Cheese Fries to have that spicy kick but I didn’t find that in this order. Nevertheless, I enjoyed eating this. It was yummy. I just wish they’d add more spice on that dish. Cecille’s quesadilla never came as the cashier failed to punch it in. We didn’t push through with the order though as we might not finish all of the food in case our contenders fail the challenge. On the other hand, Ed was trying hard to stop himself from reaching the cheese fries as he needed all the space his stomach can get. He actually ate before we met up so he was kinda worried he might not complete the challenge. 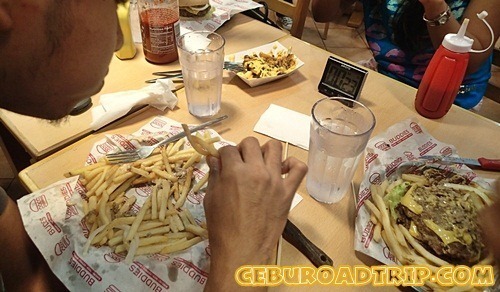 While Cille and I were enjoying our burger, the staff arrived and placed the timer on the table. Then finally, the ULTIMATE BUDDY BURGER arrived. Two orders of four layers of fat and juicy burger patty got served on our table. 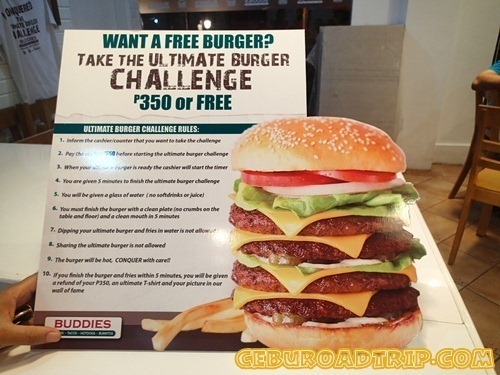 It was so kind of the staff to allow us to take photos of the Ultimate Buddy Burger before the challenge began. It gave the guys more time to let everything sink in. 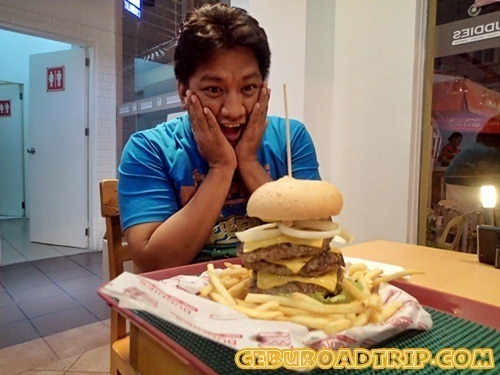 To be honest, to me, the burger doesn’t look that big. In fact, one would think that eating up the whole thing would be an easy feat. But the guys had a different take on it. 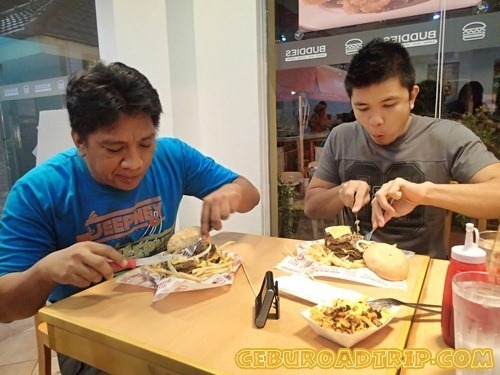 Once the timer was set, Ed and Titus started munching their burgers. They had no plan of attack. Instead of picking up the burgers and eating like a madman, they decided to be gentle with it and used a knife and fork! Their alibi? The patties are hot! Too hot for them to pick up, they said. For the next 5 minutes, we just concentrated on documenting the whole challenge while cheering them up. We continued to cheer them up not minding the stares we were getting from other diners. I hope they got entertained in the process. hehe. At 2:44 minutes, Ed was already half way down his set of burger patties but Titus was slowing down. He couldn’t take it to east fast while the burger was still hot. 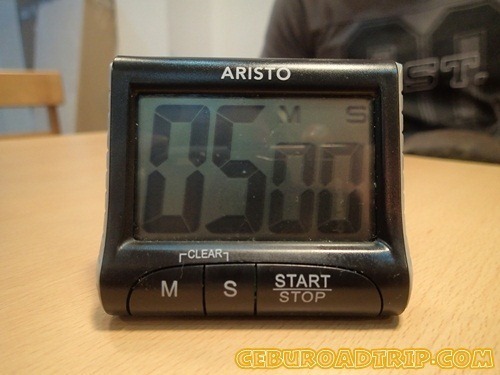 Soon, the clocked ticked faster and before we knew it, they only had one minute left. Knowing that Titus won’t make it, Cille advised him to stop eating fast and to take his time finishing the burger. On the other hand, all of our eyes were glued at Ed’s plate. At 4 minutes, he chowed down the burger and he was on his last minute eating up all the fries. But sad to say, at less than 25 seconds, Ed decided he couldn’t take it anymore. He found it impossible to chew all of the fries left on his plate at 20 seconds, so he also gave up. Titus was still halfway through his quadruple burger while Ed only had a handful of fries left on his table. Both of them lost the challenge but it made a very lasting impression on their tummies. They swear they won’t be eating any burger in the near future because of what transpired that evening. 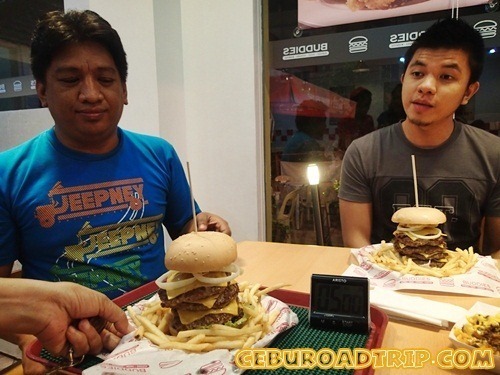 Our friend Lakbay Diva joined in after he got off from work and he ordered the same Ultimate Buddy Burger, but he didn’t take the challenge. He simply wanted to savor on every bite of the burger. 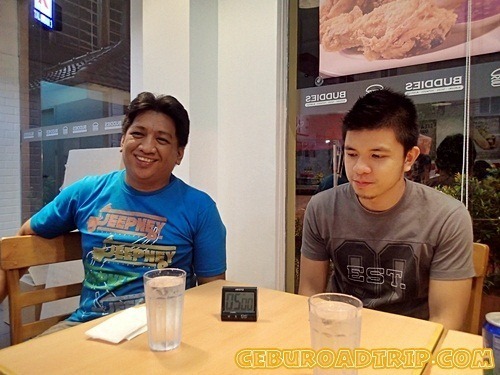 As for Ed, who was seated next to him, he tried hard not looking at what Lakbay’s eating to avoid puking. In fact he wanted to cover his nose badly to avoid sniffing the burger’s aroma. 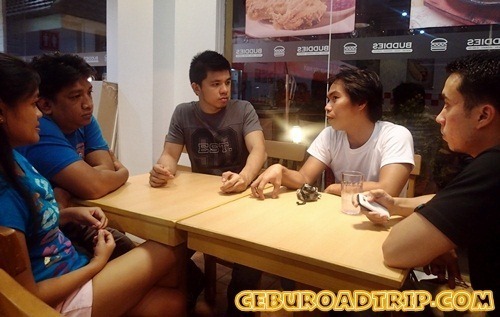 We spent the rest of the time discussing about blogging, how to monetize our sites and our travel plans. You see, we all had one thing in common. Some of us share the same passion for food, for blogging but all of us have one common denominator – our passion for travelling. And that’s what made the rest of our discussions more interesting. We had a great time dining at Buddies. Trying to conquer the Ultimate Burger Challenge was really something. Maybe, if all of us were too hungry up to the point of loosing our wits, we’d all probably conquer that challenge. Overall, the burgers weren’t that bad. I’d still come back here if given the chance. That way I could also taste their other food offerings. Sounds like they cheated if the burgers were too hot to eat.